Recently, I had the distinct pleasure of taking part in what I'm sure would be considered a very unusual scenario: 19th century mourning. 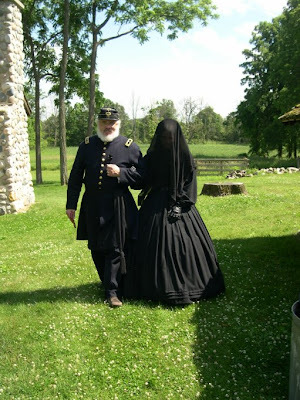 Specifically, Civil War era mourning. This living history event took place at Waterloo Farms in Waterloo, Michigan on June 28th and 29th. 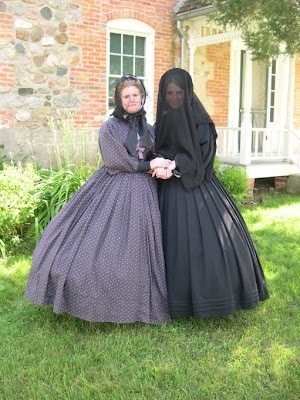 Please allow me to explain a bit about mourning in the 1860's. First off, death happened quite frequently during the Civil War, and not only due to battle deaths (although over 600,000 men died either in battle or of disease during the four years of the war). Infant mortality rate was extremely high, in some cases nearly 50%; death during childbirth was the number one cause of a woman's death; and then there were the "everyday" causes: consumption (TB), influenza, cancer, pneumonia, etc. As you can see, death during the 1860's was so very much a part of life - seemingly much more than in our modern society. Deep Mourning - This was the first stage of mourning, and it immediately followed the death of a husband, wife, or child. 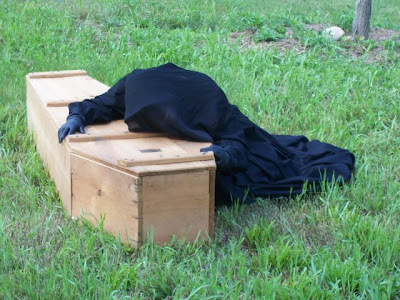 A woman (let's say she's a widow) in deep mourning would wear all black, including, while out in public, gloves and a black veil over her face. She would not speak with anyone but her family or closest friends. She would not attend parties or get-togethers and would basically seclude herself from the public in general. She would stay in this deep mourning for at least a year and a day. Sometimes women would never come out of deep mourning. Once the widow left deep mourning, she would then enter second mourning. At this stage she could stop wearing the veil in public and could begin to trim her bonnet with a little bit of white fabric. She could also wear decorative mourning buttons and jewelry. The next mourning stage was called half mourning. This stage allowed the widow to reintroduce some color (purple, gray, lilac, etc.) back into their clothing. Dresses with bold prints were also acceptable fashion. 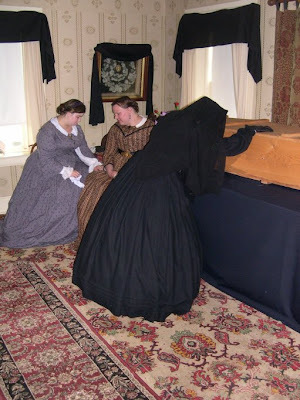 After a little over two years, the widow would store her mourning clothing and begin wearing her normal everyday wear. For a man, mourning was quite different. Men were needed to take care of the family, therefore he was needed to return to his occupation as soon as the deceased was buried. A male's mourning garb was his best (dark) suit with a weeper (made of crape) wrapped around the hatband of his hat. Although there are some differences of opinions, most agree that men also wore a black armband. A man might wear a black cockade on his lapel as well. Once a widower's wife was buried, chances are pretty good that he might look for a new wife soon after - especially if he had young children at home. Here's the kicker: if he re-married shortly after his deceased wife was buried, his new wife would then mourn for the first wife, wearing all of the mourning clothing and going through the stages as descibed above! I do not completely understand my interest in the mourning procedures of the 19th century, but I'm not alone in this infatuation. I have found many folks - especially in the reenacting hobby - who also have a strong interest in this as well. During our mourning presentation in Waterloo, we not only showed what mourning was like in the home, but we also held a funeral, with a pall bearers, a procession to a graveyard, and a preacher reciting the 23rd Psalm - pretty much everything was accurate except a real body in the coffin (that's coming up in Hastings, Michigan July 19th and 20th! ), and a burial. 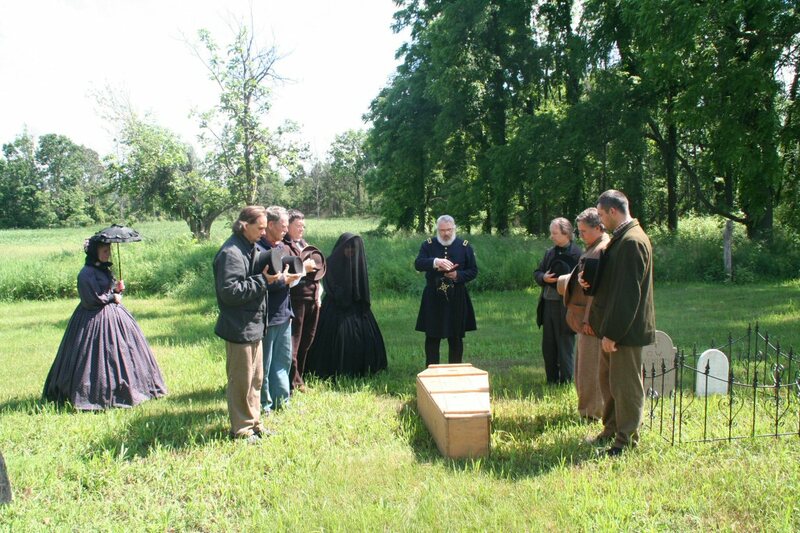 As we proceeded with our scenario in Waterloo, I had more than one patron comment on how the respect that, at one time, was shown to the dead is long gone, that people would rather "party" instead of mourn, and the deceased is soon forgotten. In many ways they are right. Oh, yes, we have the three day funeral and all that, but it is quite different today. I mean, I do believe that a party for the dearly departed is not such a bad thing. But, there should be more time and more ritual for the mourning process. It's scenarios like this that help to bring history to life (so to speak! ), hence the title "Living History." This is also why I reenact - this is my passion. And this is why I belong to more than one reenacting unit. I must give thanks to Tonya Hunter (our "deep mourner") for putting together the scenario at Waterloo Farms where she is a member of the board of directors. You did an awesome job Tonya! 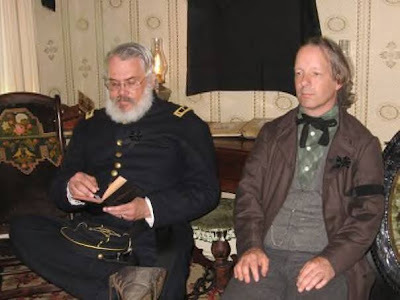 And many thanks to Sandy Melcher (our "half stage mourner" - see picture at left of both Sandy and Tonya) for all of her knowledge about not only the mourning practices of the 1860's, but her knowledge of the total social history of the Civil War era itself. As I told my wife (and, yes, to Sandy herself), I want to be the "male Sandy Melcher," and become this wealth of mid-19th century knowledge and information as Mrs. Melcher truly is. I have a lo-o-ong way to go to even be within the same league as Mrs. Melcher, but it gives me something to strive for! Oh, and I cannot forget the mourning knowledge of my very good friend, Kim Parr, of the Crocker House Museum in Mt. Clemens. Another wealth of mourning knowledge!